Public hearings on the rewriting of the Endangered Species Act stir up controversy among environmentalists and their opponents. The Endangered Species Act, enormously popular at its inception in 1973, now faces serious challenges as it comes up for revision. Jasper Carlton, head of the Biodiversity Legal Foundation in Boulder, Colo., was "guerilla lawyering" to protect threatened species in court. Hank Fischer of Defenders of Wildlife tries to use communication and consensus-building to save endangered species. Saving the bull trout will require the cooperation of five states and 34 national forests. A writer thoughtfully considers the philosophical and religious ramifications of the struggle to save endangered species. 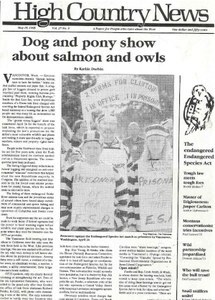 Semi-special issue on Endangered Species Act; more responses to Margolis piece; reader surveys. A wolf released in Yellowstone gives birth to pups near Red Lodge, Mont., after her mate is illegally killed. A once-quiet hot springs is overwhelmed by visitors after guidebooks tout it. Amid rumors of violence, the Forest Service backs down on its plan to cut the number of Kit and Sherry Laney's cows that graze a wilderness allotment.